Welcome to our 3 bedroom 2 bath home that sleeps 14 In the Heart of Osage Beach near the hospital at Nichols Exit. The home has 2 king beds and 5 queen beds. Close to everything. This waterfront home sites in a protected cove just a few hundred yards from the main channel and just a couple miles to all the amenities of the City of Osage Beach!! Enjoy the magnificent view of the main channel and the cove while you barbecue on the deck. There is a king bedroom downstairs, upstairs bedrooms with two queen beds in each room (one is elevated) both levels have full baths. There are televisions in each bedroom as well as a large flat screen in the living room area along with hi-speed wireless internet access! The kitchen is fully stocked for all of your cooking needs, and a private washer and dryer are available if you choose to do laundry during your stay. We supply shampoo, body wash, toilet tissue, Kleenex, paper towels, towels, linens, laundry detergent, dish soap, etc. We have decorated the unit with vivid eye catching colors and inspirational wall art for a very positive upbeat feel. We rent our home year round and we offer many specials during the 'off season'. We look forward to sharing our home with you and your family and friends and hope to hear from you the next time that you plan a visit to the lake!! 20.5 Mile Marker, Lake Front, Six foot by 30 foot long pier for tying up any size boat. No smoking inside. Pets require additional deposit. I don't want to rent to more than 12 adults at one time. The house is too small. No Parties. Neighbors are my friends. Great people who are looking out for everyone. My father loved to fish and moved my family to the lake when I was 15 from Indy. Attended high school at the Lake, spend four years as a Us Army military policeman in Germany before getting my degree in civil engineering from university of Missouri-Rolla. I have an engineering office for my firm in the lake area and in St. Louis. My busy life with our 5 kids doesn't allow us to use my lake house as much as we like. We hope some day to spend the summers of our retirement years here at the Lake. Please share my home that I have loved for many years. We are looking clients/ friends / tenants that will back year after year. Sleep 12 or more people on the six beds and three couches. Do your laundry on site with a fully stocked kitchen and big screen TVs. Wifi and TV included. We have a Roku, but no cable. Full capacity is with 12 adults with room for a few kids. Give me a call to discuss your needs. The home faces South by Southeast...This allow you to enjoy the sunrise over the Ozark hills in the morning and relish the shade of the trees and hills in the hot summer evenings. Dead end street, a mile from the hospital, grocery store many restaurants and entertainment. Just a couple miles to the mall and the best restaurants at the Lake. The center of the boating world...just around the corner to the party cove or turn left and get into quite waters up river. Safe and sound neighborhood of great friendly people from all over the Midwest. Osage Beach Water Front of the Lake of the Ozarks!! Located at the 20.5 Mile Marker on the Osage Beach side in the middle of everything. 20 feet from the home to the water edge. Ice maker, garbage compactor, garbage disposal, microwave with browning, oven, large refrigerator, ceramic cook top,toaster, service ware and cooking equipment. Perfect for a large group getaway on the lake! Matt’s place was perfect for our girls’ weekend! There are 6 total beds so we each bunked up and everyone had a bed to sleep in. 2 of the beds are suspended but they have a light and fan installed above them and the beds were very comfortable. There were great spaces for all including a downstairs living room and bar area, deck space, and a dock. We brought our own floaties and spent a whole afternoon just laying on the dock and floating in the water. Matt’s place is close to Dawg Days resteraunt and swim up bar but it is quite the drive by car to places like Shady Gators and Coconuts. The whole place was clean including the linens. We all enjoyed our time. This was a great weekend!!! I was the planner of my friend’s bachelor party, and the trip could not have turned out any better. We arrived on Friday and left on Sunday. The owner was very flexible with our arrival time which helped as we traveled from Chicago. There were 9 guys on this trip, and the house was accommodating for everything we needed. The place has 4 bedrooms, some with lofted beds that gave us enough sleeping space. We took full advantage of the deck that has tables and plenty of chairs in addition to the grill. Most of our time spent at the house was outside on the deck which has access right off the kitchen. The kitchen was fully stocked with pots, pan, and utensils to make any type of meals. We had three vehicles, two of which were XL SUVs, and we all fit in the available parking spots. The home is on a hill, so the outdoor space for kids to play is minimal, but for us we had room to set up some boards and play bags. We took advantage of the dock as we rented a boat with a driver who was able to pick us up and drop us off right at the dock. The owner was good from beginning to end. I was provided information about things to do, boats, bars, as well as being honest about previous groups that stayed. The process to reserve was not difficult nor was getting back the security deposit. I was able to communicate with the owner if I had any questions while I was staying at the house. Mr. Queen....thank you for staying with us! The stay at this location was excellent. Great, clean house with lots of space for our group of 12. Had great access to a dock where we were able to park our boat rental. I would definitely stay at this location again. We had a great time. We had a large group of 13 with small children and there was plenty of room for all of us. The kids loved the bunk beds. It would have been nice to have a table to sit at when eating. The breakfast bar was big enough for the kids and when it wasn't raining the rest of us could sit outside. Unfortunately we had 3 days of rain. When it wasn't raining we were out in our boat. It is nice and close to the state park. We would stay here again. Our stay was great! We had a fairly large family group and never felt crowded. Lots of outdoor space too! We also had an older person with disabilities and were able to wheel her down the ramp side walk to the downstairs which worked out great. We would stay here again. Thank you for your business. I hope to have the ramp all the way to the dock some day! We made this our family vacation and had a great time. The location is great, close to golf course, on the water restaurants and stores and shopping. We couldn't have asked for better! We would definitely stay here again. Thank you so much for staying. Would love to have you again. Thanks for taking the time to post a review. 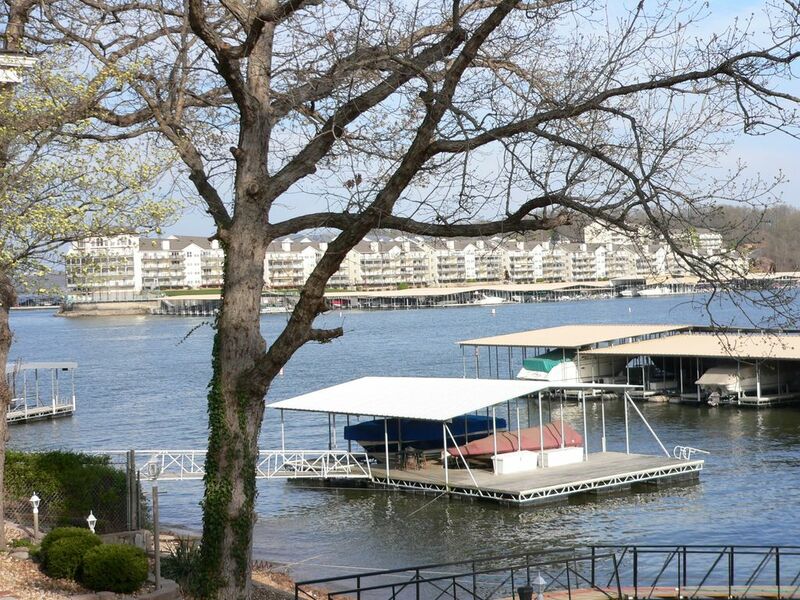 Shopping, night life, great neighborhood close to everything great about lake of the Ozarks. 20.5 MM, a mile away from public beach, marina, hiking trails, public park. A couple miles from the mall, golf, in door water park, Big Surf Water Park, Miner Mikes, City Park, big surf water park, grocery store 1.5 miles away. Great area for biking, walking and just relax on the deck.